There are probably a thousand oven types and models, all built and behaving differently. You should always use the temperatures and times mentioned in our, and all other, recipes as indications. You have to adjust them to the workings of your own oven to get the best baking result. If your heating system is too close to your bread (in other words if your oven is quite small) the top could burn. 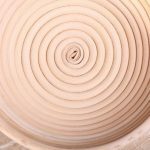 You have to adjust your temperature, or make sure that you turn your oven temp down after about 10 minutes so the spirals stop heating. The closer the top of your oven is to your bread the more heat will get transferred fast which means quicker browning and potential burning! Introduce steam in your oven to allow the dough to expand at the beginning of the baking process. The moisture keeps the outside moist and gelatinous. So while the inside of your bread wants to expand under the heat, it is not kept back by a dried out outer shell. This is known as oven spring. you have to make sure your bread is in the oven together with the steam and close the oven door very quickly to make sure the steam stays in. One regular used method is to have a tray in the oven, put bread in the oven, poor the hot water on the tray and quickly close the door so the steam is trapped. You can also try putting (sauna) stones in the tray in your oven on which to poor the water. The hot stones will create a lot of steam. Another option is to spray the oven walls with water but you have to make absolutely sure your oven is not damaged by doing this (electronics, oven window, ceramic walls can all damage from water or sudden temperature shock! The simpler your oven is built, the less stuff can get damaged). You can simulate the workings of a stone oven by starting your baking on a high temperature (250) and lower your oven temperature 10 minutes later to stop the browning, but still continuing the baking of the bread. The higher starting temperature will give you a better oven spring. You can use your oven as a proofing cabinet by preheating it for a minute to 25 ºC / 77 ºF to 30 ºC / 85 ºF and then turning it off when you put the dough in to proof (temperature depending on your recipe and intentions). We do this with our small stone oven. 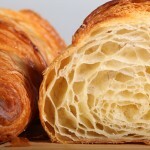 It retains the temperature for a long time because of the stones and isolation and we proof our croissants this way for example. If you are not satisfied with the baking results from your oven, try creating an ‘oven in an oven’ by using a cast iron pan (Dutch oven!) or a cloche, if your oven can accommodate this. The lid of the pan or cloche traps moisture rising from the dough and creates the steam that produces a crusty loaf with creamy crumb. Make sure you preheat the oven and pan together. Have any good oven tips to add? We would be very pleased if you’d share them with us! 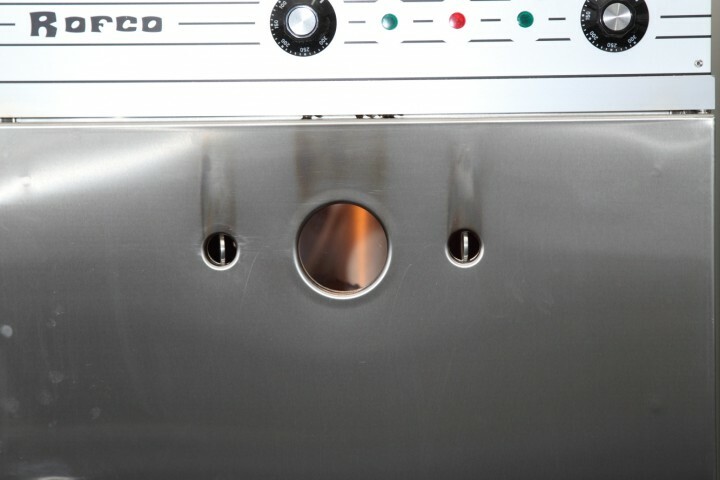 Also check out our tips and tricks for Rofco oven and stone oven users. I live in San Francisco and have picked up the fantastic art of baking sourdough loaves! I will be relocating the Netherlands soon and I am looking for a semi-professional oven to ramp up my baking to multiple loaves at a time. Is there anyone here who has some experience and tips for the use and buying of semi-professional ovens and which type to buy (specifically in the Netherlands)? I have looked at the differences between convection and deck ovens, gas or electric, etc. Price for the B40 will be somewhere around 2200 euro we think. Second hand ovens are offered, we guess about once a month, mostly in Belgium. Hi from NZ . 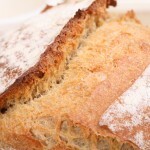 I made your pain natural today – definitely the best loaf I have made and I have tried a few recipes ! Great crust and crumb structure with loads of holes. Thank you Chrissy for your enthusiastic feedback and for sharing your method. We agree, this is such a great method to get direct heat and steam to the loaf, often not achieved in a household oven, which often already loses a lot of heat when opening the oven door and putting in a cold piece of dough for instance. I was wondering if you would be able to provide any information on using a fan forced oven? I sourdough seems to be browning really quickly, I’m worried he crust will burn before the loaf is cooked though. It is no problem using a fan oven, but always keep in mind to adjust the temperature compared to conventional of course (lower by at least 10%) and when baking your loaves, as soon as the crust has the reached the desired color, temper your oven so the bread will still be cooked but the browning will practically stop. So temper the oven to 170 or 180 C probably after 15 to 20 minutes and bake for the remaining time on the lower heat (so do not shorten the time). No mention was made of the pre baking of when letting the dough to rise! You are right Aldo, we can add this as a good tip , thank you! Would you (or someone reading this) be able to give advice on buying a conventional kitchen built-in oven that is excellent for bread baking? I am thinking to buy a good ‘normal’ oven instead of a Rofco f.e., so that my appartment doesn’t fill up with ‘kitchen machines’. Comparing ovens online is very difficult I think… Hoping to get some tips here! Hope somebody can give a good tip based on experience, because we do have a household oven, but do not bake bread in it. What we can add as a tip is the importance of an even bake, so check what other buyers of your desired oven say in reviews about heat distribution and their baking results. For people who love to bake bread, but do not have the resources or space to invest in a semi professional oven I might have a tip, a simple oldfashioned gasoven!! They can be found second hand easily below a 100 euros in the Netherlands. In my opinion far better for bread than allmost anything electric I have tried in my life. The surface I bake most of my bread on are simple tiles of red terracotta, of about 15 mm thick, probably meant for a rustic looking floor in the seventies. I recently bought two tiles of concrete (meant for decoration) of roughly the same dimensions, and they allso give good baking results. (I just baked a loaf partially on terracotta, partially on concrete, and I see no difference in colour nor in texture) So concrete does it just as well as terracotta. Indeed this creates thermal mass and a nice crust on the bottom of my loafs. They are a lot heavier all together than just one pizza stone. For pizza I get the best results baking on a layer of small pavement bricks I have found in my garden. I like to play with different types of tiles and stones in my oven. At the moment I am experimenting producing my own terracotta tiles (which will be baked elsewhere) maybe with the print of the paws of my cat in it. Very interesting, thank you for sharing. Just be careful with the stones inside the concrete, as we have heard stories about stones exploding when exposed to heat and water. Always make sure stones you use are suitable for baking bread in an oven. Chamotte and lava stones (also used in saunas) for example are safe to use. Thanks for your concern, and your advice. The concrete tiles I wrote about are not the kind of tiles you ride your bike on (which I thoroughly dislike), but rather designed for wall decoration. I think they are just a mixture of sand and cement and that there is not a single pebble involved in them. I think exposing hot stones to liquid water is quite a lot different from just baking bread or even pizza upon them. It doesn’t seem to make the same kind of contact. That is for me the magic of baking on stone. You put a plastic mass which for about 40% consists out of liquid water upon a surface well over 300 degrees in the case of pizza, and it doesn’t make a hissing sound, it doesnt smoke, it doesnt burn, It doesn’t stick, Isn’t that just a miracle by itself? Thinking about the hot stone and water thing, I guess that the bricks, which are made out of red clay and a lot harder than bricks for walls, (klinkers in Dutch) would easily survive the test of spraying water on them to create some steam in the oven, they have survived barbecue adventures and following campfires a lot of times, but why would I put water in an oven which produces enough vapour by itself? Meanwhile I am thinking of creating tiles for baking, instead of large pizza stones, be it out of clay, or some kind of sand and cement mixture, both for creative reasons, (paws of cat, or whatever) and practical reasons, smaller tiles will fit in any oven, and will allso be a lot more easy to clean too, just because they are smaller. I see that this message has become a bit longer than intended, and the same goes for the time my very young sourdough takes to double in size, being in a glass container. 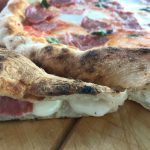 Thanks a lot for your very interesting post on “baking bread/pizza in a gas-oven” ! Actually, I was complaining (very French ;)…) for having a (bad) gas-oven in our new house and that I’m struggling a lot to bake my bread. The gas-fire being only on the bottow part of the oven, my bread has often a burned bottom or/and a very pale top. In my last attempts, I tried to simulated a clay oven using my refractory ceramic cocotte to bake the bread. It works better (crunchy surface), but it is still not convenient to follow the development (volume and color) of the bread inside. And every manipulation of the super-hot heavy cocotte just to open the cocotte and check the color of the bread inside drops the oven-temperature. So I’m very tempted to try to terracotta or lava stone tiles solution ! – do you also have fire only in the bottow part of your gas-oven? – do you only use a layer of tiles on the middle-grill of the oven, or do you also use an other layer on a top-grill (above the bread)? – using stone make you re-ajust the temperature according the recipes (lower/higher)? Sounds like you know exactly what you are doing, also based on a lot of experience, it is just wise to warn people who are less experienced to be careful with what they use and not damage their oven or worse. That is correct, because there are so many types and sizes of ovens. In our stone oven you can bake bread on any tier, some ovens have one shelf / tier. You always need to make sure the top of the bread is not too close to the heating element of your oven to avoid burning. So for a lot of (the smaller) household ovens baking on the bottom tier would be best. Sorry but “baking on the bottom tier” directly above the heating element just doesn’t seem to make sense. One might think better to take it high above the heating element to avoid burning? Furthest away from the heating element, the better? No? Most bakers ‘complain’ about the top of the loaf burning or browning too fast. So in that case, where the top is too close to the top heating element, the advice would be to, if possible, keep it a bit further from this top element. Of course if the problem is a burning of the bottom you need to take that into account. Lowering the oven temp for the second halve of the baking time, after reaching the right coloring is also a very good option. I love your site and have baked the San Francisco style sourdough and the Sourdough pain naturel,the pitas and the Fougasse. Very fun and rewarding!!! I started baking bread in January so I experimented with a lot of different recipes and so far I have been the most happy with your recipes. I have a cheap conventional oven which is hotter in the back so I spin my loaves A LOT. I also find my bread is very good if I bake it in a lidded clay pot for the first 20-25 minutes ( spinning the loaves unnecessary while lid is on}.I am very proud of the loaves I have been baking so thank-you for your recipes and information about bread baking. Your site is very easy to work from and fun to peruse. So once again thank-you for your site and helping make bread baking so fun and simple. Hi Angel, We do not really understand your question. Do you mean in general or a specific type of oven? Hello, I have searched your wonderful site for ‘Fan Assisted’ and found no mention of it. So my question is should I use my oven with the fan off when baking bread – does it make a difference? Perhaps it will dry out the bread too much? It’s a Bosch double electric oven by the way and I’ve found that I can get a good temperature for proving if I just turn on the inspection lamp in the top section. Given the option we would not use a fan function when baking bread, indeed because of the crust drying out too quickly and inhibiting good oven spring. Using the oven as proofing cabinet is great, we do it with our small stone oven and household oven too. Hello; I recently found your website and have found it very interesting and useful. I have a relatively new electric oven and am hesitant to add any amount of steam via stones and water etc. as I have been told it can damage the electronics. My question is will this bread still come out okay if I bake the bread on a baking stone but cover it with an upturned pot to trap steam from the bread itself. I have made sourdough loaves from a different recipe which I bake in a covered cast iron pot, and removing the lid towards the end to allow the bread to brown. Is your recipe wet enough for this? I haven’t actually tried it yet. Perhaps spritzing the loaf with warm water before placing in the oven would work also Just wondering what you would advise in this respect. When you say ‘your recipe’ can you tell us to which of our recipes you are referring? You are very right. We know in these types of oven the best results are reported back to us with the cast iron pan or pot method. 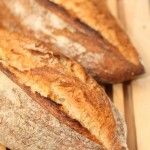 This also goes for our pain rustique recipe, people have tried it and are positive about the results. So do give it a try with this method and let us know the result and please be careful with the hot pan and lit! Firstly, thank you for a great site. Your passion and effort shines through. A truly superb site. I thought my suggestion for steam would be useful for your readers. For steam, I simply use stones from my garden. Stones and pebbles can also be picked up from beach. On the floor of my oven, I heat about 5 large stones in a shallow baking tray (deep enough to fill with a kettle of boiling water). My rectangle baking stone, (to bake the bread on) also goes in at the same time on a shelf. Once the oven has reached its maximum temperature, I boil a kettle of water and then add my bread/s to the rectangle baking stone (I take the rectangle baking stone out of the oven and place it on a heat proof surface – this makes the whole process of transferring the shaped dough easier). Finally, I make sure my hands and forearms are covered with a cloth, my face is turned away and then I add the kettle of boiling water. As soon as the water hits the stones, there is an immediate and large amount of steam. Then I close the oven door whilst the stones are hissing and steaming. Stones from your garden or the beach is a cheap and easy solution to expensive sauna stones and when I’m finished with the stones, I just throw them back in the garden. If you give this a go, please remember to cover your hands and forearms when pouring in the boiling water and keep your face as far away as possible. The steam is immediate. Also, when you open the oven door to remove your bread – STAND BACK or to the side. There may still be some residual steam. I don’t remove the stones and baking tray until the oven has cooled. Have fun! Thank you for your addition on the subject Sharon. We just want to add a word of caution about the stones. We have read stories about stones exploding when exposed to heat and water. So some stones will work fine and others can be even dangerous! So to make sure there is no risk we would advice to use the lava stones that are also use in saunas and steam rooms or make very sure the stones you use can stand the heat! If you want to bake a lot of bread for other people, you need a lot of practice and you should find somebody local or a baking school to learn the trade. To learn to become a good baker you need to put in a lot of baking hours. I have a comvencion like racional oven at the restaurant how should I cook it steam mix or…. I baked my first loaf yesterday! It came out a little lopsided with a burn on oneside after 35 min of baking. The outside was very crunchy and the inside was quite soft. I think it didn’t cook all the way inside because the crumb was too close together. I was wondering if I should take it down 10c after 10 min? I was cooking it at 230c the whole time till I removed it. It still got a baker’s ear and my family loved it with its minor imperfections! It is indeed a good idea to start at 230, then temper the oven and be sure to bake for the full baking time the loaf needs (for example a 750 g bread needs 45 minutes). This should also help prevent the burning (make sure the loaf is not too close to heating elements on one side). I have a small table top oven which has top and bottom heating. I would like to know whether I should use top and bottom heating together to bake the bread ? Or should I use only the bottom heating ? It depends a bit, normally top and bottom together is best. It could also be that the top of your loaf is very close to your heating element, because the oven is small. That is why it could be that it works best to start with both and then, when the top has the right color, to turn off the top heating and bake the rest of the time with only bottom heat. Good luck with your oven and happy baking! As always, thank you so much for your advice, yesterday i got obsessed with the “sauna rocks” so i did some research. After a lot of research, i found that you can find those rocks under the name of “lava rocks” “piedra volcánica” or “tezontle rojo” in any place that sells stuff for gardens, and they should sell them cheap! less than $10 dlls (for a very big bag). So I bought a bag at home depot, put some stones inside of a big bowl made of “barro” and they worked like a charm, no splashing, no explosions, nothing else than a beautiful and clear odorless steam. We think you found exactly the right stones for the job and at a very good price. I think this advice is helpful to people both in Mexico and far beyond the borders. Thank you for sharing and so great to hear about the result. Thank you very much Ed & Marieke, you made it more clear for me, I assume my decision is almost taken. Hey, nice advices, very good website! I might be interested in the rofco B5 oven,some honest advise concerning that oven would be appreciated, I know you have a bigger one but it looks like it’s the same construction. 1. I’d like to know what is the height of 1 of your rofco chamber oven (from 1 stone to the top of the chamber)? 2. About how long do you have to wait to reach 245°C with your oven? 3. Did you actually have difficulties baking small breads? from about 80 to 200g of dough? 4. Is the heating from back to front and side to side the same? or did you notice some irregularity like crust color a bit different? I’m sorry for asking all this but that oven is quite an investment, and you look like a perfectionist person in baking wich is what I also am. You are right, it is the same construction, but we have never seen a B5 ‘live’ we have to say. The height of an oven chamber of our B20 is 16cm, I assume it is the same with the B5. For the B20 heating to 245C would take about 1 hour and 15 minutes. I would think that the B5 is a little faster. 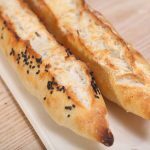 There is no difficulty whatsoever baking small breads and rolls, we bake them from 70g up to 2 kg and it all comes out well. Overall we are still very happy with both our Rofco ovens and we can truly say we get very different results from what you would get in your regular household oven. It is a simple construction and if all goes well it should last many baking years. I recently bought the Haussler Mono oven. After three attempts to make German “Swabisch Bauernbrot” I was finally very pleased with the performance of the oven. It is expensive, especially if you buy the Back-station complete with mixer and oven. The making of German bread is quite different from Dutch or French loafs. I also would like to thank Marieke for her guidance and advice. Wish you lots of baking-fun. Thanks for the addition Guus, and always glad to help where possible! Hope your oven may turn out many more wonderful loaves. But my problem is: what oven to buy? I have a very small kitchen, no room for a built-in oven, so I need a small “stand alone”. My little Moulinex is slowly getting less reliable due to old age, so I need to replace it. A Rofco would be fabulous, of course, but: I can bake bread in an ordinary oven, I can’t use a Rofco for quickly browning an oven dish (well I could, but it would not be practical). A Rofco is too big, anyway. So I’m looking for a small (but big enough for two pan loaves or my big Staub), simple (a knob for temp and a knob for time, is all I need) and reliable oven – and all I can find are Tefals and LG’s with lots of “toeters en bellen” I don’t need or want, and their thermostats are very unreliable. We have looked into it and come to the same conclusion as you have. The little Rofco B5 would be perfect for your bread baking of two loaves and also for the Staub, but will not suit all of your baking. The small stand alone ovens all seem to be designed with the ‘toeters en bellen’ to make them attractive, but it is just the thing you do NOT want. You are used to your Moulinex and I guess you like it, so maybe a newer model would be an option. It is even more expensive than a Rofco. Just thought I would mention it anyway. We have no experience ourselves with these ovens and we always like to give advice from experience. I hope somebody else will have some more useful information for you. Good luck with the search and till then hope your Moulinex will keep going! Great addition Bill! Your oven and the way you incorporated it into your beautiful kitchen is just stunning. Going to take a look at those other brands you mentioned, also just out of curiosity because they are new to us. As an aside: there is scope for a “bread oven soap opera” here. You will see on the Manz webite the Owners names are Dagmar and Robert Hausler. Aparantly Robert is the younger Hausler brother and met Dagmar, heir to the Manz family buiness at a trade show. They got married and now run the Manz oven bsuiness which competes with the Haussler oven business. There must be a film script in there somewhere! Love and Loafs – like it. How about: “The sourdough saga,” episode 1, “Lust among the crust.” I have a feeling that in the US this would be a “straight to cable TV” drama with titles like that.